At the Y, our sports staff, coaches, and volunteers all share a singular vision of helping all youth reach their full potential in life. We leverage the excitement and passion around recreational and competitive programming to create a healthy outlet for children to gain new skills, develop a sense of team and connect with positive role models. T-ball, soccer, volleyball, football, and basketball – check out the sports offerings and get in the game. 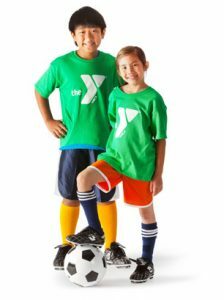 Improve skills, make new friends, be active with other kids and learn to love a sport at the Y. Do you have old cleats or shin guards? Donate them to the Y! Stay tuned for dates that we’ll open up our cleat locker to the public. Used cleats will be available for purchase for $2.00/pair, and shin guards for $1/pair. Or, you can exchange a pair of your old cleats or shin guards for another pair at no cost. As we prepare for the Spring 2019 Soccer Season, YMCA of Northwest Louisiana Youth Sports is excited to announce a partnership with FC Dallas that will enhance our youth soccer program. This partnership brings together two quality organizations, both focused on providing a positive experience for young players. Learn more about this program offering.